Solheimajokull glacier is one of the stunning outlet glaciers originated from Myrdalsjokull ice cap. Stretching out from the southwest of the glorious Myrdalsjokull, the glacier tongue extends in the length of eight kilometers with two kilometers in width. It’s one of the easiest glaciers to reach from Reykjavik — only 158 kilometers (98 mile) away. The scenic ride from Reykjavik takes on the southern rim from west to east for about two hours before you reach Solheimajokull parking lot. From Vik, the driving distance is only 31 kilometers. Vik is a beautiful town sitting on the oceanfront of the southern tip, and one of the South Coast highlight attractions. Solheimajokull is a popular recreational hub for those who are based near Reykjavik, Selfoss, and Vik. Solheimajokull Glacier is located by the South Coast of Iceland, approximately 160 km from Reykjavik. Perfect for an adventure day trip or simply to add an exciting activity to your day of sightseeing in Iceland. Glacier Guides offer tours both with transfer from Reykjavik, and meet-on-location tours for those who have rented a car. We offer glacier hiking tours for everybody, from beginners to experts. The mighty Myrdalsjokull glacier is the fourth largest ice cap in Iceland covering an area of 600 sq-km (232 sq-mi). In English, Myrdalsjokull means “mire dale glacier” or “mire valley glacier.” It said that the highest peak of Myrdalsjokull, Godabunga, can reach the height of 1515 meters above sea level. The second highest peak Habunga is also more than 1500 meters high. Sadly, those figures may be no longer valid since the glacier has been melting immensely. By Google satellite imaging, we can see how much the ice cap has shrunk on Myrdalsjokull. The ice cap of the nearby Eyjafjallajokull glacier used to be, somehow, connected to Myrdalsjokull. But ever since 2006, the ice that’s connecting the two ice caps started to disappear, leaving the two glaciers separated. You may have heard about the infamous Eyjafjallajokull glacier from the news in 2010 when its massive eruption disrupted the air travel in many parts of Europe. The high-profile media exposure overshadowed its neighbor Myrdalsjokull which, by the way, is no less than an equally powerful counterpart. Beneath the seemingly peaceful ice cap of Myrdalsjokull, it lies the “monster volcano” Katla. It has an immense caldera that measures 10-kilometers (6.2 mile) in diameter. This very active volcano had 20 documented major eruptions between 930 and 1918 AD at the intervals of 13 — 95 years. The most recent Katla eruption powerfully took place in 1918. It extended the Southern coast for 5 kilometers by the massive amount of laharic flood deposits from the eruption. Its 1755 eruption lasted for 120 days and is still considered the longest eruption in Katla’s history. Judging on Katla’s eruption cycle, we are probably very close to its next tantrum. While Myrdalsjokull glacier conceals such intensive volcanic power under its averaged 250-meter thick ice cap, the numerous outlet glaciers look rather peaceful. They are part of the unique feature of Myrdalsjokull. Especially for Solheimajokull glacier tongue, it intrudes out to the most brilliant section of Iceland — the South Coast. Hiking on the glacier, the limitless icescape and mountain ranges will present you with an unparalleled view. The rugged glacier on Solheimajokull is perfect for ice climbing. The activity sounds like it requires a lot of muscle strength. If you feel you are on the lower side of the muscle strength chart, you can start with a small climb to become familiar with the ice axe techniques. And the professional guides are always willing to assist. Many scientists believe that melting glacier is one of the most visible signs of climate change. In Iceland, about 11 billion tons of glacial ice melt every year due to rising of temperature. Among all the melting glaciers, Solheimajokull is considered a textbook case of demonstrating how rapid the melting process has been. If you are in Iceland, it’s highly recommended to visit Solheimajokull glacier before it shrinks even more. One of the most common natural phenomena in this area is the glacial floods created by the eruptions under the ice caps of Myrdalsjokull. It’s also called glacier-outburst flood. In addition to smoke, ash and the visible molten lava, glacial flood is another immediate danger caused by an Icelandic volcanic eruption. And it’s hard to predict even for the modern science. The Icelandic word for glacial flood is “jokulhlaup.” It has been adopted by many languages in their glaciology terms including English. Solheimasandur is a glacial outwash plain situated about 5 kilometers south of Solheimajokull. Over the course of history, glacial floods repeatedly rushed over the southern lowland, making Solheimasandur impossible to settle. The unpredictable glacial floods and the violent Katla eruptions limited the human traces and left the boundless coastline pristine and wild. Now, Solheimasandur is a vast desert of black sands and considered a must-visit attraction. Many say that the vista resembles the landscape on the moon. A mysterious plane wreck has been there for decades, quietly giving out an intriguing vibe on the desert of volcanic sands and ashes. In fact, the twists and turns behind the plot do sound dramatic. On November 21, 1973, a U.S. Navy crew were steering a Douglas C-177 airplane heading to the then Navy base in Keflavik from Stokksnes, a town located near Hofn in East Iceland. The weather was bad with low visibility. As the flying condition got worse, an even more dire situation occurred — they ran out of fuel. Through the unclear sky, the pilot decided to direct the plane toward the south to the ocean to make an emergency landing, in the attempt to save the crew from crashing into a mountain. When their altitude got lower, the crew saw immense black sand coastline. It looked like a less ominous landing option. Fortunately, it was. The plane landed perfectly without causing the crew members any bad injuries. The frozen wasteland saved the skillful Navy men and crafted a legendary story that passed on ever since. The Navy later came to take whatever they could and left the plane on the vast black desert. From that moment, the plane wreck became an inherent part of the features at Solheimasandur. The lucky bravery and the plane remains are always mentioned when people talk about Solheimasandur. Many visitors choose to include an excursion to the plane wreck site in their Solheimajokull or South Coast itinerary. You can go for a glacier hike on Solheimajokull in the morning. Then, it’s only an eight-minute drive from Solheimajokull parking lot to the parking at the beach. You will need to take a short walk on the black sand beach backdropped by the hauntingly beautiful landscapes of the southern highland. Have you ever dreamed of walking on the endless, jagged glacier ice? Just like the movie “Interstellar” in which the NASA pilots walked on the icy surface of planet Mann. Solheimajokull is a desirable place for you to fulfill this dream. There are numerous outlet glaciers in Iceland where the visitors can sign up for a glacier hiking tour. Solheimajokull distinguishes itself from other glacier tongues because of several features. It’s easy to access via Ring Road which is very convenient for those who are based in the Capital Region or other major towns along the road, like Selfoss and Vik. Then, the glacier is prominent on the southern lowland, allowing you an undisturbed view of the incredible South Coast. Lastly, the amazing sceneries and highlight attractions on the South Coast are within a 70-kilometer radius of Solheimajokull parking. The rule for glacier hiking is to go with a professional guide. Many crevasses and sinkholes on the glacier can be potentially dangerous for the untrained eyes. For glacier guides, they have passed several training courses and are capable of directing the participants on the right track and making the guided tour a safe experience for those who are in a fit state of health. In order to walk on the glacier ice safely, you need a pair of sturdy, mid-cut hiking boots and a set of powerful ice crampons, and following the rules of dressing. The glacier tour operators usually provide crampons and other necessary types of equipment. You can rent hiking boots by paying a small fee. After the guide delivers the safety instruction and glacier hiking tips, your exciting glacier walk finally begins. You might have already seen many aerial glacier landscape images online. The impressive interlacing patterns created by the crevasses are indescribably beautiful. It feels even more incredible when you step on it. Ahead of you is the endless glacier ice. Standing in the middle of the ice cracks between the huge ice walls, you have the intimate moment with the interweaving, ancient ice formation. You will see different colors. Some parts are milky blue, other parts can be transparent like crystal. On the surface of the glacier, you will see a thin layer of the black volcanic ash covering the snowy white ice displaying a striking contrast. In the wintertime, the snow falls and remains on the surface of the glacier. When you walk, the crampons on your hiking boots will make the crunchy sounds pressing the snow and the ice together. Each sound will be a reminder of an unforgettable, unique hiking memory in the making. These glacier hiking day tours are usually in a small group. You will have abundant time to take photos and enjoy the splendid view. It’s an exciting journey filled with rapturous sentiments. For an easy glacier hike on Solheimajokull, you can join the meet-on-location group. It’s perfect for those who want an adventurous diversion on their South Coast sightseeing trip. Of course, the fun-seekers who stay in Reykjavik won’t be left out, you can hop on our picking-up bus to Solheimajokull. After a scenic morning ride, your experienced guide will be expecting you with safety instructions and equipment at the foot of the majestic Solheimajokull glacier tongue. This activity is the grand opening of your mesmerizing trip. On your way back to the capital, you will stop by two of the South Coast highlights. When the sun moves to the west, it’s the best time of a day to see Seljalandsfoss waterfall! An extensive glacier hiking route designed for outdoor lovers is also operated all year round. In this expedition, you have the chance to travel far to the pristine blue glacier and see the dramatic sceneries on the face of the earth. Among all the glacier tours in Iceland, ice climbing is considered one of the most thrilling activities. After a short but totally amazing glacier hike, your professional guide will lead you to a huge ice wall. Strictly speaking, it’s a part of an immense crevasse that’s pinpoint for such activity. You will be fully equipped with a helmet, a pair of ice axes, a pair of attachable boot spikes and a climbing safety harness. After your glacier guides set up the ice climbing route, you will test your climbing skills on the giant ice wall with the support of the climbing rope and your gears. On your way up, every courageous move you take will create an amazing feeling. Your effort will be rewarded by the grand view of the crevasse riddled outlet glacier with the amazing ice formations, sinkholes, and jagged ridges. Ice climbing sounds like one of these intriguing extreme sports that only professional mountaineers can accomplish. But, here in Iceland, the easily accessible glacier tongues and the well-trained glacier guides are making this exhilarating activity attempting for those who dare and dream of trying. The “Blue Ice” adventure is a fantastic combination of glacier hiking and ice climbing. It’s precisely designed in the context of the popular demand and the friendly glacier environment. You can experience two Icelandic features during one trip. The South Coast of Iceland is embedded by copious charming sceneries and epic landscapes. The region is accessible via Ring Road, which is the national highway that encircles Iceland. In the south, the contrasting features between glacier mountains and the southern lowland fostered a diverse range of landscapes. You will cross silver rivers originated from the glaciers and pass by endless grassland, shorelines and black sand deserts. You will also encounter the longest river in Iceland. Originated from Hofsjokull, which is the third largest glacier in Iceland, River Thjorsa (Þjórsár in Icelandic) runs 230 kilometers (about 143 miles) from the center of Iceland all the way to its south river mouth. It’s also the second-most voluminous river in Iceland. Thjorsa and other two rivers together stream along the borders of the Great Thjorsa Lava, the largest lava flow in Iceland, (Þjórsárhraun in Icelandic). The lava field was created in a single eruption from 8600 years ago. Now, the lava surface is beneath the lowland and only appears until 70 kilometers downstream of its supposed crater area. The towns of Selfoss, Eyrarbakki, and Stokkseyri are all built on this largest and most voluminous lava field. On the fine-grained land mass, the mineral-rich Thjorsa river flows across the bay area creating a stunning area of estuaries with dazzling colors, making the veins of Iceland a starking contrast against the pulsating volcanic land. Right ahead via Ring Road, you are about to arrive at Seljalandsfoss, one of the most stunning waterfalls in Iceland. Its stream is originated from the notorious Eyjafjallajokull glacier. You can also find the hidden gem of Gljufrabui waterfall seven hundred meters away. Both are located on the side of the road that leads to Thorsmork valley. The next sight on Ring Road to the south is Eyjafjallajokull glacier, Myrdalsjokull glacier, and Solheimajokull glacier tongue. Many visitors come here solely for the exquisite views. If you plan to focus on sightseeing in the south but don’t want to rule out the option of a glacier adventure, you can join the South Coast sightseeing and glacier tour from Reykjavik. On the route, you will see the most famous and fabulous waterfalls and Reykjasjara Black Sand Beach. 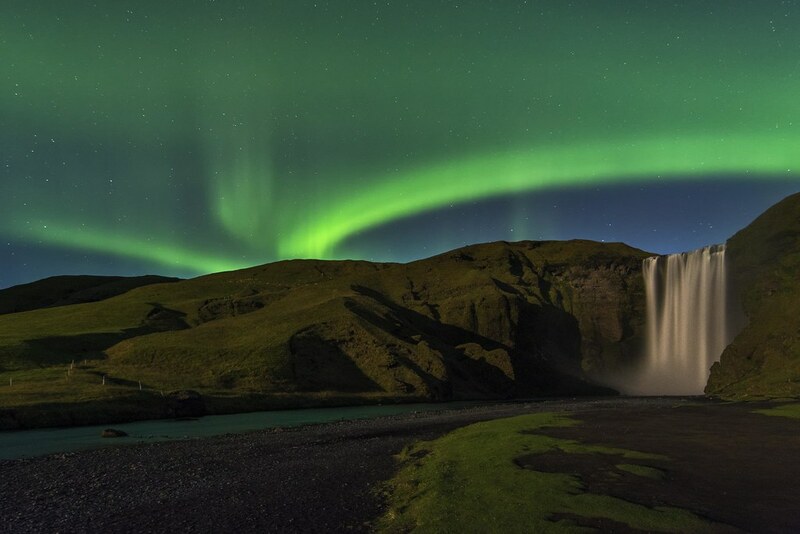 On your way back to the capital, you will explore Skogafoss waterfall. The voluminous flow drops from the rugged cliff with a cascade of 25 meters (82 feet) in width and 60 meters (197 feet) in height, making an overwhelmingly beautiful and vivid scene on the tacit land. In winter, there is a chance that you can see the Northern Lights dancing in the sky accompanied by the movement of the waterfall. Going further east along the southern rim, you will reach Jokulsarlon Glacier Lagoon. The nearby Vatnajokull National Park is also a natural wonderland where you will find the blue ice caves. All these wonderful attractions make the South Coast the most visited area, along with the Golden Circle. Below, you can find the attraction highlights near Solheimajokull glacier tongues on South Coast. We have a wonderful easy glacier hike and our popular glacier hiking & ice climbing tour available from Solheimajokull Glacier. Check out our glacier hiking tours from Reykjavik if you would like to include transportation.